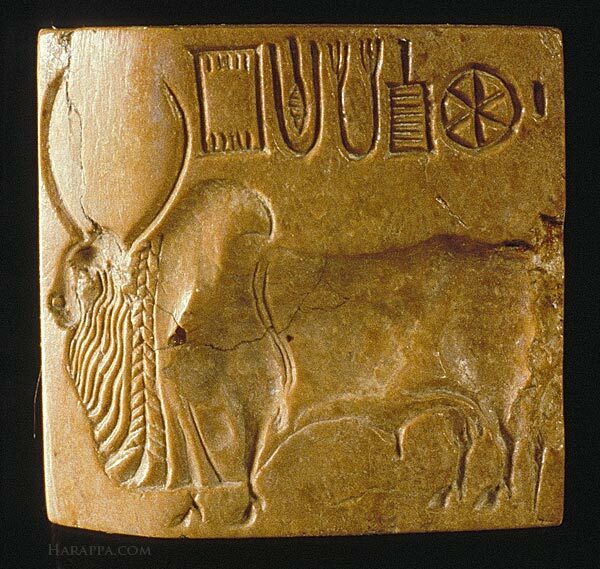 This is pure speculation, but in looking at this long seal from Mohenjo-daro [M-1271], and seal signs from Mesopotamia which we know the meaning of, it could just be that some of the Indus signs are also names of places or of particular cities. They almost look like part of a family, and a "family" of traders and merchants it would have been moving across the Indus and Mesopotamian cities for whom an "international" standard would have useful to trade, as it apparently is today. 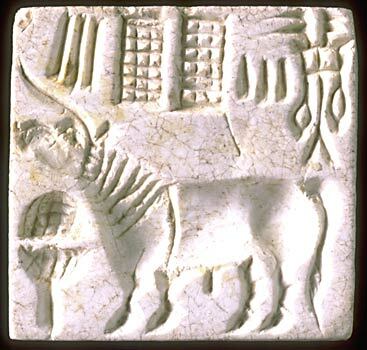 Other Indus seals below, even a magnificent bull seal, have similar compound-evoking signs like the three middle signs, and perhaps even the rightmost, though there is a potential reading of that by Mahadevan as a farmer, tiller or tenant, which, come to think of it, is also land-related. 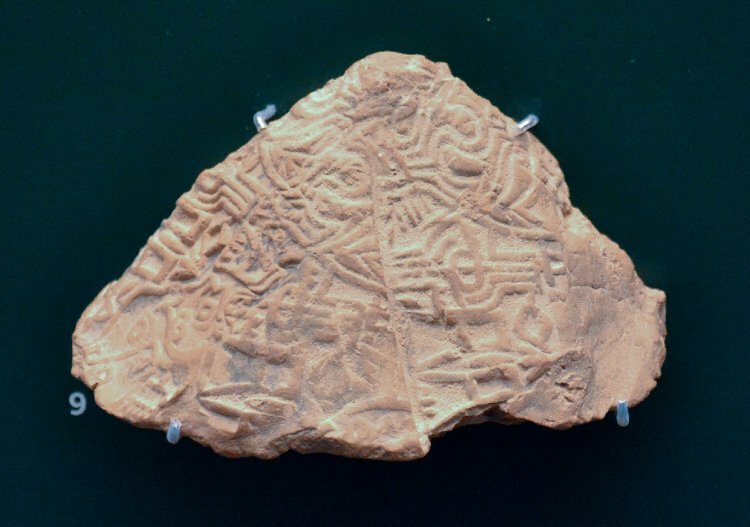 The Mesopotamian and Indus signs do suggest clear boundaries, if not walls, that most Indus cities and Mesopotamian ones did have, typically but perhaps not exclusively for protection. Asko Parpola does not rule out place names as signs, and offers the tantalizing clue of a unique sign  and its possible relationship to the name of Chanhiyun Jo Daro [Chanhudaro]. 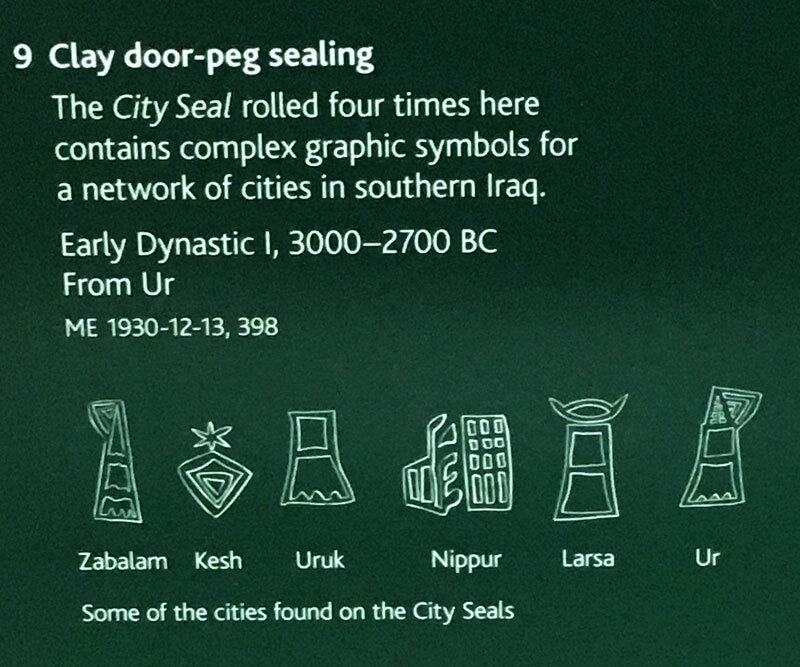 Caption in the museum display case: The clay door-peg sealing contains complex graphic symbols for a network of cities in southern Iraq. Early Dynastic I, 3000-2700 BC From Ur ME 1930-12-13, 398. "At this time Uruk was surrounded by a massive wall, which according to tradition was built on the orders of King Gilgamesh. Although he may have been an actual king of Uruk around 2700 B.C., Gilgamesh became the hero of many later stories and epics," from the Met.